I've often talked about my ridiculously huge TBR pile (currently at 135 books, the shame!) so when I saw Lindsey Rey's Intimidating TBR Pile tag going around booktube lately, I knew I had to join in! I'm not sure if this is going to encourage me to get to these books any sooner, but it can't hurt to try, right? I bought The Luminaries by Eleanor Catton a couple of years ago because quite a few people had said it was their favourite book of that year. Then I tried to read it, and I failed. I tried, I really did! I got about 300 pages in and just couldn't get into it. I liked the concept but it was just overly descriptive, I'm talking pages and pages of description and I found the plot confusing and it just wasn't working out. So I DNF'ed it and gave it away. But then, I saw it on Audible for £2.99 so I decided to get it, to see if listening to it would be more interesting, so it's back on my TBR. I just can't cope with not finishing a book! I feel like when I get round to reading the full A Song of Ice and Fire series it's going to be a big time commitment. I read the first two, but then I wanted to read other things, and I feel like it's not a series you can dip in and out of. Once you're in, you kind of have to stick with it and that's just something I don't feel like I have time for right now. I read Throne of Glass and Crown of Midnight last year and I've been meaning to pick up Heir of Fire ever since but for some reason I just haven't got round to it. This is a sequel that I definitely need to read soon! I received a proof of Pretty Is by Maggie Mitchell from Orion just yesterday so I haven't had a chance to read it yet! It's a psychological thriller set to be released in April 2016 and sounds really interesting so no doubt I'll get to it soon. This is quite a difficult one because if I don't like an author I don't tend to pick up their other works, I guess that makes me pretty judgemental! But when looking through my TBR pile for this tag I came across A Portrait of the Artist as a Young Man by James Joyce. I read Ulysses at university and didn't particularly enjoy it so I'm not sure why I have this on my TBR but I might read it one day, you never know. This definitely has to be The Emperor of All Maladies: A Biography of Cancer by Siddartha Mukherjee. I think you can probably tell from the title why I've not yet been in the mood to read this. I bought it for research for a project at university and also because John Green recommended it as an excellent non-fiction book but I think I'm just going to have to be in a specific mood to read this one. I really want to read The Goldfinch by Donna Tartt but at a whopping 864 pages, this tome is kind of intimidating. But that's what the TBR jar is for, one day I'll pull it out and have no choice but to dive right in! I had to look up the Goodreads ratings for this one as there aren't really any books on my TBR that I haven't picked up for this reason. I think Songs of the Humpback Whale by Jodi Picoult was a cover/blurb buy that I bought at a carboot on a whim and it only has a 3.18 rating on Goodreads, but that doesn't really bother me too much, I'll still pick it up at some point. There are quite a few hefty classics on my TBR that are intimidating but in the end I settled on American Gods by Neil Gaiman. This book is intimidating to me for a couple of reasons. Firstly, I've never actually read any Neil Gaiman (I know, I should go and live under the stairs right?) and secondly, it seems like not only a lengthy book but a pretty complex one and I'm just scared that I won't get into it. Have you read it? What did you think? I tag everyone and anyone who's reading this! Is your TBR pile as crazy as mine? 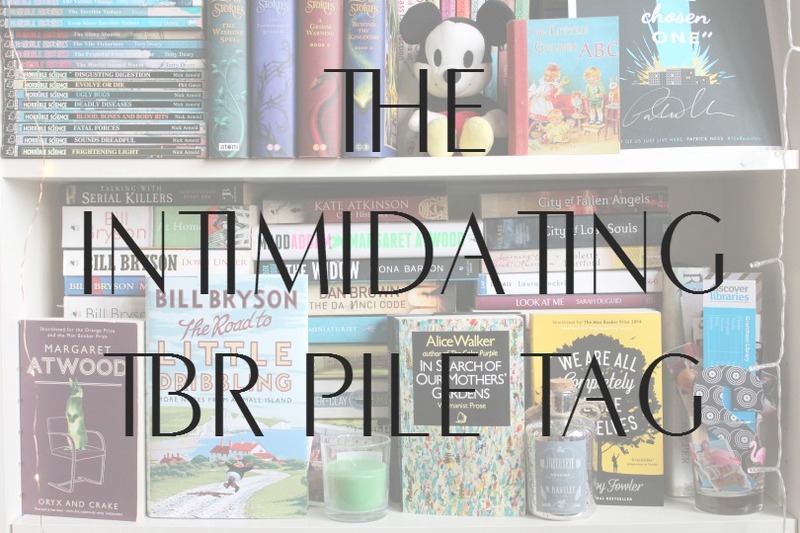 What's the most intimidating book on your TBR?